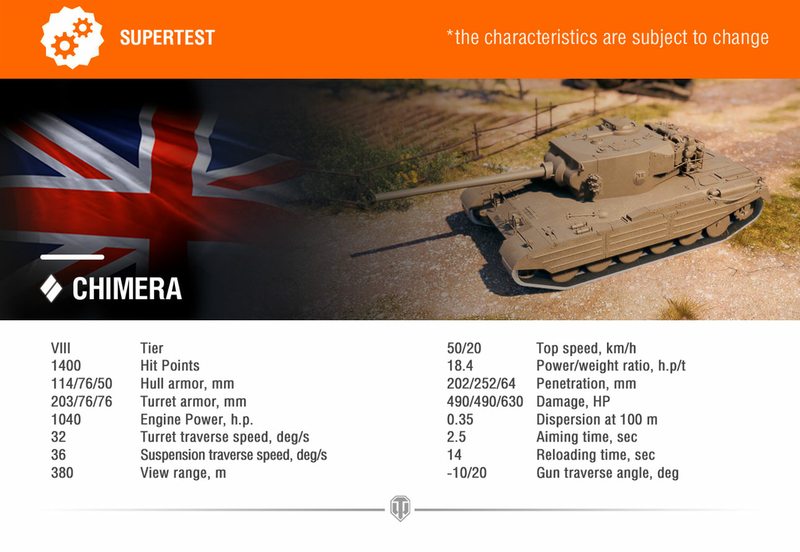 I wanted to let you know that a brand new Tier VIII British Medium tank with an awesome gun has entered the Supertest. It is called the Chimera, and it’s your somewhat typical medium tank with good mobility. Its maneuverability, hull armor, and size are comparable to that of other British vehicles of the same type, but its turret protection is slightly better. The Chimera’s gun is what really stands out on this tank—not just among the British line, but among mediums in general. 490 points of alpha damage is definitely an outlier on a Tier VIII tank. Great alpha, tough turret, good speed, and nice gun depression make the Chimera quite versatile. It can play as a sniper or provide fire support and lay some powerful punches on the enemies. Of course, we did want to make sure the tank is properly balanced. So, an outstanding feature (like a huge alpha) should be compensated for. In the Chimera’s case, we did this with the penetration. 202mm with the basic round is far from best in class/Tier, and you will have to look for optimal firing positions and go for opponents’ weaker spots. This is the first stage of testing, and Chimera’s stats may change depending on the results. However, we intend to keep its signature high alpha. You know the drill, please let us know what you think! Best of luck in your battles and make sure to follow the news on this tank! Why? Gosh, why? Give it 175 penetration, then you can talk about it having compensating low penetration. The T-54 mod 1 has 190 penetration for its standard round, and that is perfectly adequate in most cases. The fact that WG thinks that 202 pen balances 490 alpha in a medium just shows how powercreep is built into the system. Don't release this vehicle with these stats. The British tradition of vertical armor plates continues. People are gonna get real mad when they get whacked by a medium tank for 500+ ! oof, the poor tier 6 tanks this is gonna munch on. why would you ever put 490 alpha at tier 8? at least the skorp G has the excuse of being a TD but this? Why? The Skorpion does it all day long. I think people are used to it by now. 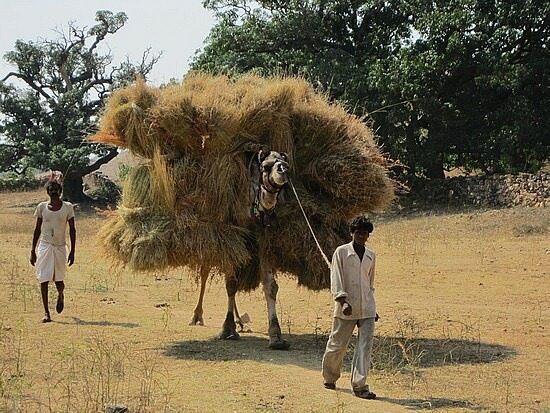 At least it doesn't have high pen HE rounds....... If this was firing high pen HESH it would be really broken. Really, this game going down the drain reaching for straws. Whole lines of tanks dont have that alpha damage. This is interesting- much as it was that the Primo Victoria was the precursor to the Cent mk1's turret armor buff, does the Chimera's current iteration likewise signal buffs for the regular tier 8s as well? If so, then wonderful. The typical tier 8 medium is laughably undergunned considering the realities of 3/5/7. If they are given additional firepower so that they become balanced by the same standards as this new Chimera and other recent premiums, that would be a step in the right direction. A high-firepower meta is far more fun and rewarding than a high-armor meta. Armor exists to be penetrated. When guns work, the game works. When armor works, the game grinds to a dysfunctional halt. As of the Chimera itself, the current numbers are very strong across the board. So the above option of generally improving firepower of other tier 8s is one way to even it out, but class-wide buffs are difficult and time consuming. The much more realistic and easy solution would be to nerf the Chimera instead. If you had to do so, nerf the frontal armor. Let it be a glass cannon compared to the Centurions. "Of course, we did want to make sure the tank is properly balanced. So, an outstanding feature (like a huge alpha) should be compensated for. In the Chimera’s case, we did this with the penetration"
....and this is compensated for with the 2 key. So lets compare this to the Ravioli. It has much better mobility, much better armor, more DPM, higher alpha, better penetration, same accuracy, and only 0.1sec worse aim time. Actually, compare it to any other premium tier 8 medium and you soon realize this just makes everything else obsolete. This is insane. Are you trying to deliberately destroy this game? Skorp can be penned by all tier 6's thou. Just more power creep. 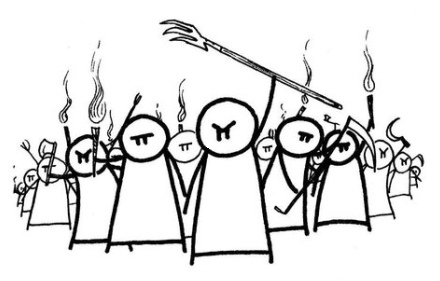 The beatings will continue until morale improves. Once I fully unlock the Skoda tier 9, I'm done. Good luck folks with this utter baloney. 490 alpha. On a medium. At tier 8. WG HQ is completely lacking in any concept of the idea of balance. I'm done with this. Final straw. I'm out. Let me guess..ANOTHER TIER 8 PREMIUM ? Because everyone knows War Shaming has all but given up with the rests of the tech trees! And unless its making money for War Shaming, they really have no interest in it. CAN YOU SAY, "BUILT FOR THE SALE AND WHO GIVES A RATS AZZ ABOUT BALANCE" ! So, does this tank have any historical basis, or was Wargaming inspired to "design" this "tank" by looking at a stain on piece of toilet paper floating in an unused lavatory in Minsk? Just wondering, because if you're so hard up for tank designs that you need to make them up, maybe you should look at the Americans. They have loooots of medium tanks that aren't in-game right now. Actually built, actually tested prototypes too. I guess what I'm saying is you don't need to go lavatory diving to find real designs to put in the game. Edited by EmpressNero, May 29 2018 - 19:27. You have to love WG. Game Discussion → General Discussion → My first 3rd MoE ever and Top 1 this month in a tank! Game Discussion → General Discussion → Armored Vehicle Discussion → Tanks and Armored Vehicles → Medium Tanks → How to Play the T26 Pershing? Game Discussion → General Discussion → Poll T-44 a keeper?